We made our short shifter for all of you. The weekend warriors, the trackday monsters, and even the daily drivers. We wanted to make something that made sense for any BMW enthusiast. For those who want to drive your car to the track, drive some hotlaps, and then drive back home, we developed a rally lever extension. Our rally lever extension allows you to keep your hands close to the steering wheel through shifts, in efforts to quicken shifts and reaction times on the track. The rally lever comes off and on in seconds with the unique locking design we engineered. For the enthusiast who wants a more connected feel for the road and the track, with a similar service life to factory and the functionality of stiffer mounts, the Monoball mounts are the way to go without question. Being designed for use on and off the track, these bushings are the all around perfect choice with the widest range of applications for driving style and level. Their serviceability and precision make them an excellent choice for an enthusiast with a daily driver they spend a good amount of time pushing hard or for the dedicated track-rat looking for a more comfortable and well-rounded alternative to poly or Delrin®. Want the Ultimate design in a rear shock tower mount? You've found it. These rear shock mounts are designed for use on the track and racing. 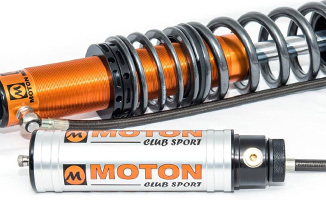 This set of mounts will help your rear shocks perform the best they can in those conditions. The advantage to using a mount with spherical bearing is that it allows the shock to freely move off axis without side loading the shock shaft like rubber or polyurethane mounts do. This tune gives your M3 more power over our previous Shark Tune. 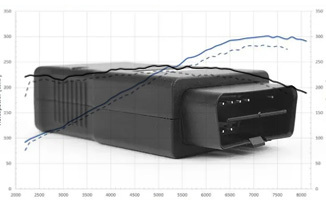 This newest M3 performance software was developed on the dyno to create maximum power and torque using premium 91 octane fuel and revising the torque limiters in the ECU, although even more power is to be had using 93 octane fuel. What's a better option than Original BMW Connecting Rod Bearings for your next engine build? WPC-treated OEM Bearings! WPC is not a coating! It is a surface treatment that adds strength and reduces the two largest enemies of any high-performance internal engine components, heat and friction. 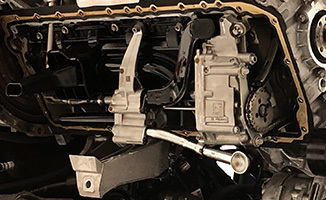 The Turner Motorsport catch can utilizes a strategically designed 4 chamber baffle plate system engineered to create multiple changes in the direction of airflow, allowing oil droplets to fall out of suspension, maximizing the efficiency of the PCV air/oil separation. 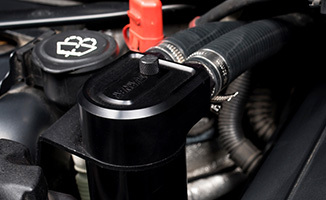 A dipstick is integrated into the cap so you can monitor the oil level, and the can is easily serviced using an integrated oil drain valve as part of your normal oil service regime. 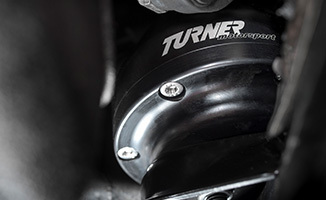 The Turner Motorsport Oil Catch Can is CNC machined from billet 6061-T6 aluminum and features a stealthy black anodized finish for lasting durability and appearance. 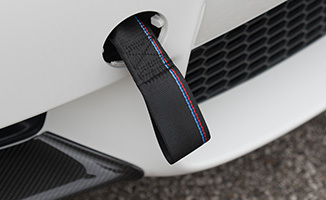 Our polyester tow strap is the best tow strap available for the modern BMW chassis. We use a heavy-duty, chemical-resistant polyester strap webbed around a stainless steel stud. This design allows for tow hooks to grab it without hitting your bumper. The Turner lightweight flywheel is designed to offer the perfect balance of comfort, smoothness, durability, and performance on any N54 powered vehicle. At 18.6lbs, 10 lbs lighter than stock, it offers significantly reduced inertia for quicker throttle response, improved rev-matching, and faster acceleration. However, unlike ultra-light aluminum flywheels it still offers a smooth idle, quiet operation with minimal increase to NVH, and smooth OE-like engagement for easy daily driver duty. We know if a soft mount offers a sloppy connection it doesn't work on the track, and a solid mount isn't acceptable as a daily driver (for most!) and set out to engineer a mount that would meet the needs for both. At the core of our enclosed design is a partially-constrained, multi-piece polyurethane bushing with precisely-set preload. 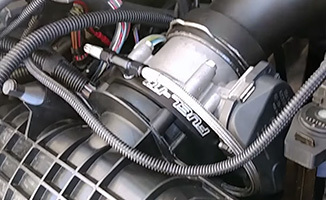 This architecture absorbs and disperses resonant engine frequencies as opposed to amplifying them (like some other designs do), which results in a positive-connection, enthusiast-feel mount with the vibration. We offer two durometers, with both densities offering similar "positive connection" feeling. 70A is slightly softer and offers more of a stock feel, while 90A delivers a little more engine "feel" while under acceleration. The performance side of these mounts is primarily found in the articulation allowed by the bearing. Rubber mounts do not allow for proper free damper movement, hindering shock performance. By eliminating the deflection found in factory rubber mounts and allowing full shock articulation, this solid monoball design eliminates slop and improves suspension feel, allowing for more predictable handling on the street or the track - with almost zero added noise, vibration, and harshness. 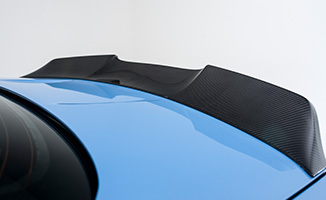 These spoilers are designed in-house to flow perfectly with the body lines not only on the trunk lid, but also paying close attention to the roof and the rear bumper. Inspired by the design of the high kick trunk found on the E46 M3 CSL, we wanted to replicate this performance aesthetic in a unique manner to perfectly compliment the factory body lines of your BMW. Crafted from high-quality hand laid carbon fiber to achieve it's world class appearance and durability, the Turner Motorsport High Kick will give your BMW aggressive styling to set it apart from the masses. 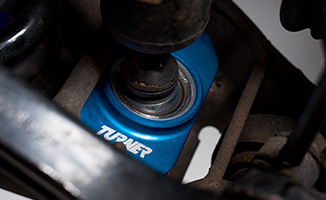 When you upgrade to a Turner silicone intake boot you get a perfect fit that will not only outlast the OE design, while also smoothing out airflow within the intake tract. This boot also eliminates the factory intake resonator giving your engine a much more aggressive sound under the hood especially at higher rpm. 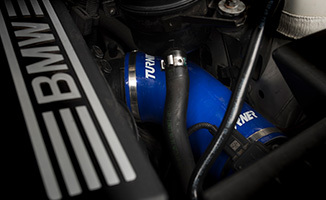 Available in black or Turner blue color, our intake boot offers either a pop of color or a cohesive, complementary look in your engine bay. 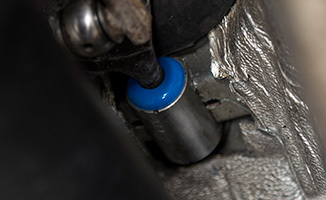 Even after rebuilding your manual transmission shifter with brand new BMW components or installing a short shift kit, your shifts will still be at the mercy of soft factory bushings. Designed with 100% comfort and low manufacturing costs in mind, BMW's factory carrier bushing offers a freedom of movement on all axis, resulting in "factory installed slop". Any manual transmission aficionado knows that when it comes to shifting, slop is the enemy. 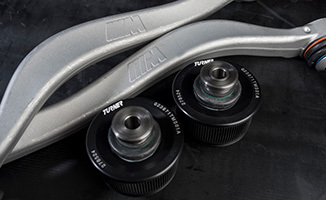 Our engineers designed a bushing that was simple to install, requiring no modifications or reuse of old components, and delivers an improved shifting experience with any factory or aftermarket performance shifter. Our carrier bushing is manufactured in the USA from 70A polyurethane, bonded securely to a 304 stainless steel housing for exceptional corrosion resistance. The result is a complete design solution that offers much crisper shifting and a more engaging driving experience with nearly zero added gearbox noise or vibrations. The biggest struggle when working on your BMW is often just being motivated to go out, jack up the car, and position your jack stands so you can shimmy on the ground. QuickJack takes all the hassle out of maintenance by being your portable lift! Raising the car in seconds with no effort makes working on your favorite BMW a breeze whether you’re at home or on the track. 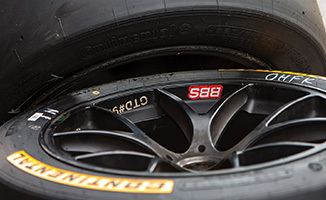 Perhaps one of the most iconic wheel producers in motorsport history, BBS has provided factory racing teams and street cars alike with innovative designs since the 1970s. 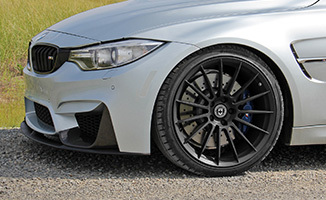 BMWs and BBS wheels are a classic combination, which is why Turner Motorsport now offers these timeless designs for your street or track car. IRP (Individual Racing Parts) is a performance aftermarket parts company that focuses on high quality and long term reliability. 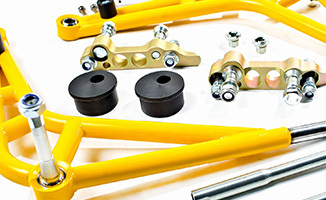 IRP offers products that strengthen common weak points in both BMW suspension and drivetrain - offering products ranging from performance flex disks, often called guibos, to rear shock mounts and adjustable control arms. 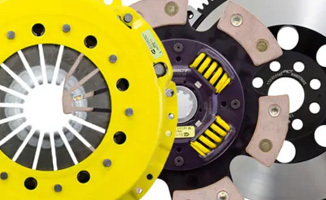 Advanced Clutch Technology (ACT) designs, engineers and develops products by leveraging decades of track and performance street experience. Advanced CAD, FEA simulation, and CAM tools help ensure highly optimized performance, reliability, and repeatability. These key advantages are produced by combining the best engineering and design methodologies with the latest in materials and manufacturing techniques. 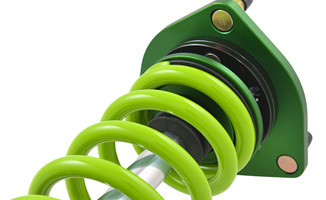 Ohlins combines passion, performance, and perfection in all of their suspension products. With a heavy focus on exploiting all of the handling capabilities of your BMW, Ohlins has been on the pursuit of suspension perfection since 1984, beginning R&D in their Swedish headquarters. These are an excellent choice for a driver who needs the pinnacle of ‘well-rounded’ suspension suitable for peak performance in multiple driving situations. 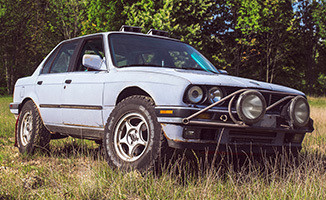 For most BMW owners, your cars are more than something that fills a necessity. Your BMW is a source of enjoyment. 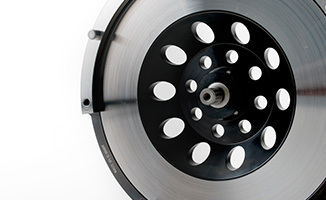 Whether you take your BMW to an occasional track event or just enjoy a spirited drive blasting tunes down your favorite road, having a brake system capable of providing sufficient force is critical. From Seattle, Washington, Sparta Evolution is a recent breakout success who manufacture high-performance big brake kits to compete with the biggest names in racing brake solutions. For over 20 years, the folks at VF Engineering in California have provided some of the highest quality superchargers on the market for European cars. 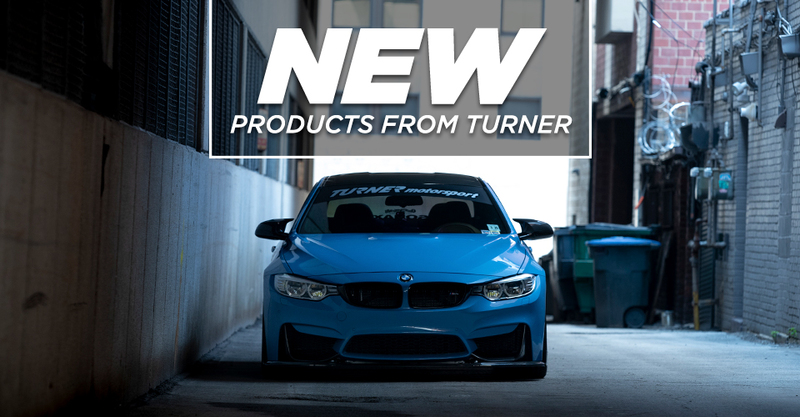 We are proud to announce that their performance parts lineup is now available on Turner Motorsport for the first time and excited to introduce you to the hair-raising power increases your BMW deserves. 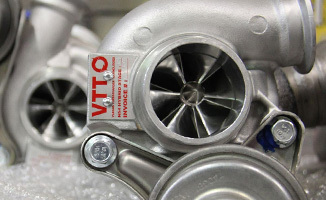 Vargas Turbo Technologies has been in business since 1979, offering rebuilt and re-engineered turbo solutions. With the N54, they identified a need for both cost-effective turbo replacements and proven turbo upgrades. The biggest complaint on N54 turbos is the rattle from the wastegates. The factory wastegates have actuator arms that lose their tension very easily, resulting in an annoying wastegate rattle. BC Racing was founded out of racing passion and a desire to provide capable and affordable suspension systems for performance street cars and dedicated racing vehicles. 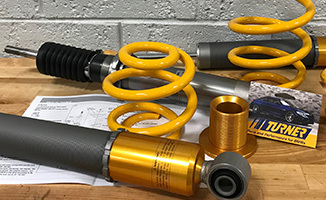 Their multiple series of coilover systems offer complete customizability and can be upgraded with Swift springs for a better ride quality and truly unique rates. 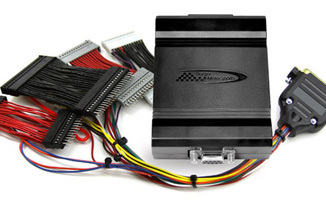 The Burger Motorsports JB4 Tuner is one of the most versatile and adaptable modifications you can make to your BMW. A true plug & play solution, the JB4 offers support for everything from stock cars to fully built monsters. Stock cars can expect gains of up to 80 WHP, while modified cars can expect to see gains up to 350 WHP! 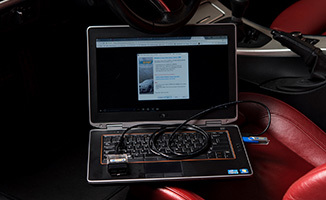 With an additional cable, you can connect your smart device or laptop to enjoy data logging and tuning capabilities. 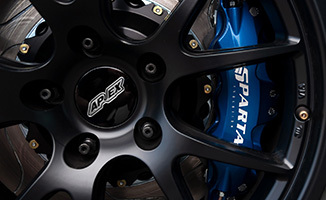 HRE Wheels has emerged as the styling leader and trend starter in the European car wheel market. HRE designs are cutting edge and exciting and are featured on the hottest street machines from SoCal to South Beach. The HRE FlowForm wheel line offers forged wheel strength and HRE's stimulating designs at a more attractive price. FF01 wheels are available in 19 " and 20" sizes that fit with the proper offsets. BMW headlights, taillights, and indicators are great from the factory, but with age, they tend to look dated and show their wear. 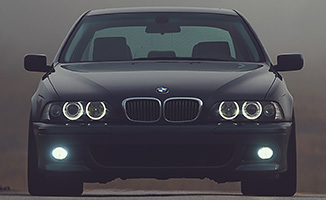 Get rid of your oxidized, broken, or outdated colored markers with DEPO lights for your BMW. DEPO lights offer either factory replacement or aftermarket improvements with European options as well as attractive and unique sets for a more modified look. Don’t let old headlights ruin the styling of your front end and improve your lighting with DEPO projectors, indicators, and taillights! ISC Coilovers are one of the most cutting-edge on the market today. 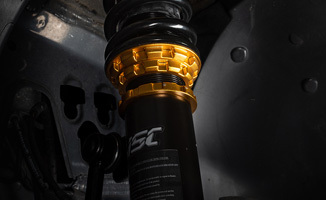 With several different spring options, from comfort to track, and even options in between in every application, ISC stands out from the competition by offering the best fit coilovers for your driving habits. With a dedication to the customer in mind, ISC is all about the extra mile. From damping and spring rate options to match your driving style to covers to help keep your coilovers clean, they offer it all. 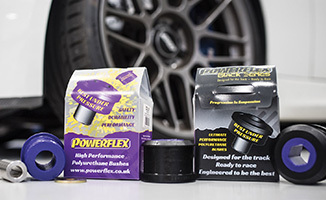 Poweflex is a leading manufacturer of aftermarket bushings. Using state of the art design and manufacturing, all replacement bushings are engineered to out-perform and out-last the ones that came in the car. Each line of bushings is meticulously tested and then re-tested to ensure perfect fitment and enduring quality through the life of the vehicle. A full lifetime warranty backs every one of their products and demonstrates the level of confidence and commitment Powerflex has to their customers. Virtually every top professional BMW engine builder relies on ARP Pro Series head studs, particularly on the S54 3.2 liter engine. ARP uses a premium grade 8740 alloy that is rated far superior to "aircraft" quality. Each stud is heat-treated to 200,000 psi, ensuring complete heat penetration. ARP studs are threaded after heat-treat, which gives them 1000% (that's ten times!) 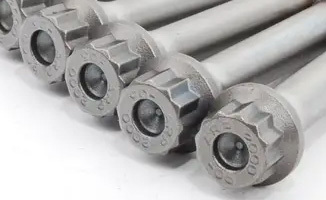 better fatigue strength than studs threaded prior to heat-treat. 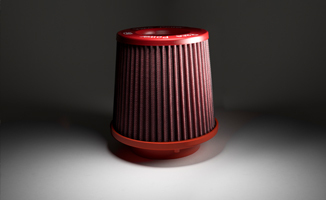 Looking to upgrade your air filter for increased flow and performance? BMC filters allow significantly higher air flow and are perfectly molded in one piece to fit exactly the same as your stock air filter. These filters are constructed from multi-layerd cotton gauze that is pre-oiled and can be cleaned and regenerated using the BMC regeneration kit. 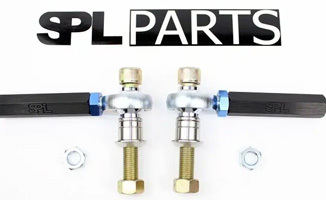 SPL Parts products are all constructed using chromoly seamless straight tubing, DOM mandrel bent tubing, and 6061 and 2024 aluminum for high strength and quality. All TIG welding and CNC machining is also done locally by professional welders and machine shops to meet exact quality standards and tolerance specifications. 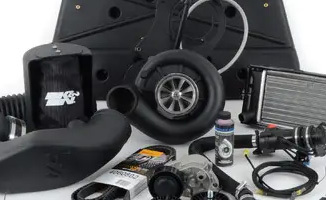 For anything from racing to street driven needs, SPL Parts offer an amazing line of premium quality products that are perfect to get your car back in spec. Water meth injection cools the intake air temperature by misting a mixture of 50% water and 50% methanol into the intake behind the intercooler but before the throttle body. This allows the mixture to vaporize rather than condense. The addition of water as pressurized steam effectively steam-cleans your engine internals, which helps with performance as well as reliability. 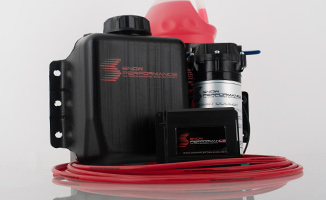 Snow Performance offers everything you need to convert your BMW to water meth! 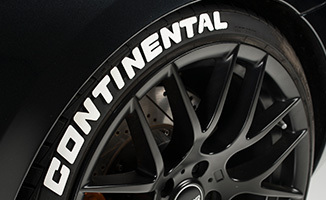 Tire lettering is an easy modification to add aggressive track styling to your wheel and tire setup. Whether you just want to add some style to your vehicle for the next track event, or if you want to keep white tire lettering on your vehicle for the life of your tires, Tire Stickers has a solution for you. Tire Stickers—Simple styling that is perfect for the track or the strip. Founded in 1999, AST was out to develop the ultimate in damper suspension systems. Professional race teams use their top-of-the-line suspension for good reason. AST has an outstanding resume, and their purchase of Moton in 2011 bolstered it. 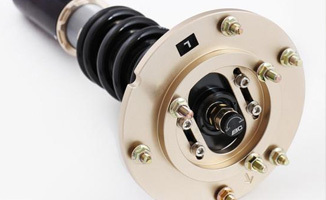 These coilovers are buildable to meet all your specific needs on the street or track. They feature: an external reservoir, spherical lower mounts, spherical upper mounts, and can be re-valved. This allows you to create a precise system to face adverse conditions with peak handling. Fortune Auto suspension is particularly popular in both Time Attack and Formula Drift, with 16 sponsored pro drivers running their suspension. Their racing pedigree is quickly growing as a product of great engineering, innovative products, and excellent quality control. HAND BUILT IN USA: Fortune Auto's extensive product lineup is custom, modular, and rebuildable. 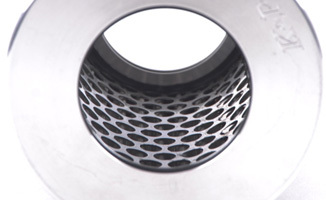 The K&P Engineering filter element is made from medical grade, type 304 stainless steel micronic filter cloth to provide unmatched protection against oil contamination and resultant engine damage. A one inch square of this material flows an incredible 1.9 gallons of oil per minute at only 1 PSI pump pressure. The adhesive used in the filter assembly process is good to 600 degrees Fahrenheit, far above normal engine operating temperatures. 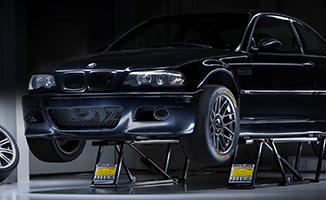 Race Skids provide a range of heavy duty skid plates for many popular classic BMW models. Constructed from heavy duty 10-gauge steel, these skid plates provide a much-needed upgrade to under-body protection. Each skid plate is black powder coated to protect the plate itself from oxidation and corrosion. This also gives the plate a smooth scratch resistant surface to keep the plate looking clean and fresh even after repeated abuse. We are proud to provide Fuel-It Low-Pressure Fuel Pump Upgrades for your N54/N55 powered BMWs! Fuel-It was born from the need to offer more capable fuel delivery to high-output turbo BMW engines and give drivers the ability to maximize their power potential without risking fuel starvation or worse. Fuel-It also offers E85 conversions to set your BMW up to breathe corn juice for more power. With their fuel delivery systems you can meet the demand of your engine and push for the highest potential. 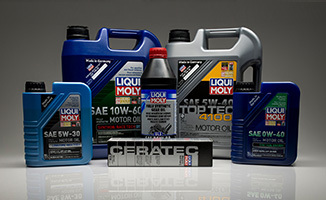 Don't let fuel be the weak spot in your modified N54 or N55!